A pair of elegant Akoya cultured pearl stud earrings with 14k white gold settings. Three brilliant diamonds accent each cultured pearl (0.09 total carat weight). These cultured pearls are very fine AAA quality, round shape, with brilliant luster and very clean surface. These cultured pearls are hand selected from pearl farms in Japan to ensure its highest quality. The jewelry is beautifully made by our skilled jewelers in USA. The jewelry comes with a high quality jewelry box and a certificate of authenticity. One of our best selling cultured pearl earrings, this pair of charming Japanese Akoya cultured pearl stud earrings are set in 14k white gold. Three brilliant diamonds accent each cultured pearl (0.09 total carat weight). These Akoya cultured pearls are AAA quality, with very high luster and clean surface. 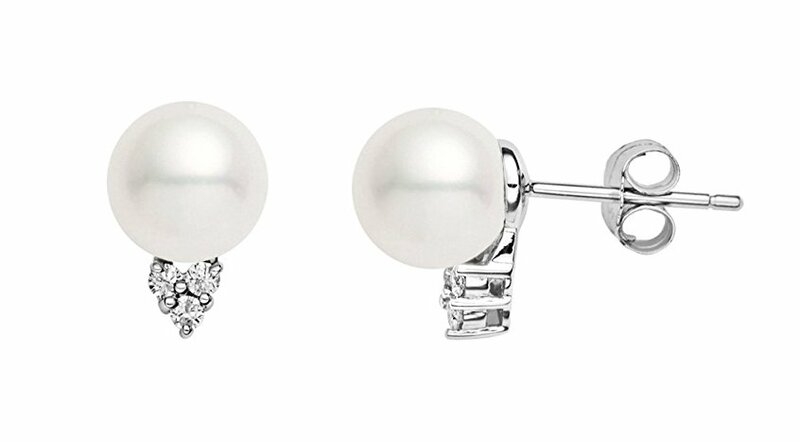 Make a stunning gift with this pair of cultured pearl earrings. This jewelry is hand made by our skilled jewelers in USA and quality controlled strictly by our pearl experts. It comes with a high quality jewelry box and a certificate of authenticity. Akoya Cultured pearls are mainly grown in ocean salt waters of Japan and China. They are the most popular cultured pearls in the world for their roundness beauty, classic and ultra-modern look, and appealing high luster. Japanese Akoya cultured pearls tend to be of a higher quality than Chinese Akoyas. Premium Pearl, Inc is a team of highly skilled cultured pearl experts, jewelers, and jewelry designers. We travel around the world to find the most beautiful cultured pearls used in our jewelry. Premium Pearl, Inc has been featured in major publications such as Audrey Magazine, L.A. Brides, and USA today.